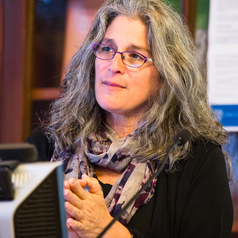 Lori Gruen is a leading scholar in Animal Studies and Feminist Philosophy. She is the author and editor of 10 books, including Ethics and Animals: An Introduction (Cambridge, 2011), Reflecting on Nature: Readings in Environmental Philosophy and Ethics (Oxford, 2012), Ethics of Captivity (Oxford, 2014), Entangled Empathy (Lantern, 2015). Her work in practical ethics focuses on issues that impact those often overlooked in traditional ethical investigations, e.g. women, people of color, non-human animals. She is a Fellow of the Hastings Center for Bioethics, a Faculty Fellow at Tufts’ Cummings School of Veterinary Medicine’s Center for Animals and Public Policy, and was the first chair of the Faculty Advisory Committee of the Center for Prison Education at Wesleyan. Gruen has documented the history of The First 100 chimpanzees in research in the US and has an evolving website that documents the journey to sanctuary of the remaining chimpanzees in research labs, The Last 1000. Her research lies at the intersection of ethical theory and ethical practice. She has written on a range of topics in practical ethics and her current projects include exploring human entanglements with non-human animals, both actual and conceptual, with an emphasis on ethical and political questions raised by captivity and carceral logics.